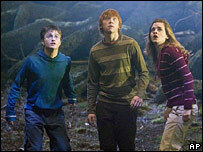 Fantasy adventure Harry Potter and the Order of the Phoenix was the most successful film at the UK and Ireland box office in 2007. The movie, the fifth in the series based on JK Rowling's best-selling books, made more than £49.4m. Pirates of the Caribbean: At World's End, came in at number two, earning in excess of £42m. 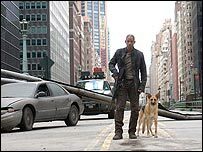 Meanwhile, Will Smith's apocalyptic thriller I Am Legend topped the UK and Ireland box office this week. Both the Harry Potter and Pirates of the Caribbean films and the third instalment of the Shrek series beat The Simpsons Movie - the first big screen outing of the animated TV sitcom. It amassed more than £38m in ticket returns to take fourth place. Action adventure Spider-Man 3 took fifth position, while the movie version Transformers came in at number seven behind animation Ratatoutille. At number 10 was Hot Fuzz, the latest film starring Spaced and Shaun of the Dead stalwarts Simon Pegg and Nick Frost, which took more than £21m. I Am Legend, the latest version of a film based on the 1950s sci-fi novel by Richard Matheson, topped the first box office chart of 2008. It took more than £6.5m after being released on Boxing Day. The film stars Will Smith as New York's apparent last human survivor of a plague which has killed millions and turned the rest of the population into mutants. It knocked fantasy film Enchanted from the top slot to number three. The Golden Compass, based on the Philip Pullman novel and starring Nicole Kidman, remained at number two. Slapstick US comedy Balls of Fury made its debut at number seven, while The Kite Runner entered at nine.